Unbounce Meetup Hits the Road: First Stop Seattle! Picture a room chock-full of your professional peers, gathered for a casual event to learn from fellow Unbounce customers, online marketers, conversion optimizers and landing page junkies. Now imagine that event was free. Cue: Where do you sign up? Righhhht here. Last month, Unbounce hosted it’s first customer event (read about it here) in Vancouver, our hometown. Now, Unbounce is hitting the road. The first stop? I’ll give you some hints. Super Bowl XLVIII Champs, the heart of Grey’s Anatomy and some great outlet shopping. Yep – you guessed it: Seattle, Washington. Before I rattle off more Seattle buzzwords, let’s get down to the important details: the when, the where and the who. Unbounce Seattleites, mark your calendar. Thursday, March 13th we are coming to town to discuss how other Unbounce customers are marketing online and how they’re optimizing their campaigns. Our friends and awesome conversion ecosystem partners, Moz just moved into their new digs. We’ll be hosting our evening at their brand spanking new office space! And from what I’ve heard, it’s pretty slick. Special shout out to Events & Sponsorship Strategist, Charlene Inoncillo for making it all happen. Danielle is a self-confessed social media addict. She drives content and social media marketing initiatives for Rival IQ, a competitive benchmarking and monitoring SaaS software solution. She’s writes regularly on the Rival IQ blog, and even wrote an awesome guest post on the Unbounce Conversion Marketing Blog. Danielle will speak about how you can use & leverage landing pages in your content & social media efforts. Mark is a PPC expert. He’s also the President & CEO of Chair 10 Marketing, Inc., an Internet marketing agency that drives leads, sales and awareness for businesses through Pay-Per-Click advertising. Mark built Chair 10 into a 7 person agency over 7 years and is now servicing both local accounts and large national brands (we wrote a case study about it). He’ll talk about how marketers can use landing pages and different SEM channels to open doors to new revenue streams. Oli has seen more landing pages than anyone on the planet. Which is exactly why he’ll be critiquing your landing page and giving you some helpful landing page tips & tricks. Interested in having your landing page critiqued at the meetup? Send me an email at meetups@unbounce.com and Oli & I will check it out. Ryan is our Director of Customer Success who along with his team, helps Unbounce customers boost their conversion rates. He’ll be talking about how to use landing pages to make a well-oiled webinar marketing machine. PS – his slide deck is Super Mario themed and includes sound effects! You! Chances are if you’re still reading this, you’re hooked and want to come. This event is dedicated to our awesome community of customers. Not a customer and want to sneak in? That’s okay too. We’re facilitating a casual evening dedicated toward landing page best practices and marketing campaigns. You’ll get to share marketing ideas, swap stories, widen your network, make new connections, get inspired… become a better marketer! See you in Seattle soon! PS – Want to see Unbounce come to your city? 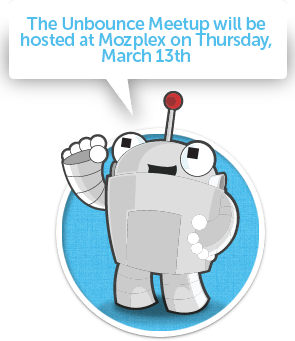 Want to plan an Unbounce meetup in your own area? Get in touch with me at meetups@unbounce.com. I’d love to help make it happen!